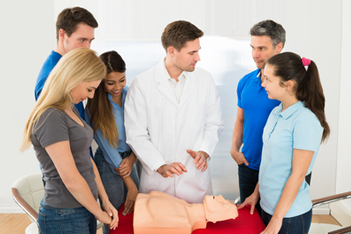 We teach the AHA BLS (Basic Life Support) CPR class which is the equivalent to the "Red Cross CPR for the Professional Rescuer" and the "Red Cross Lifeguard CPR" class. CPRed combines the original and renewal course so we can offer more classes to fit the schedules of our students. Skills covered: single and team rescuer CPR, practice use of AED, rescue mask, bag valve mask, advanced airway technique, and infant, child, and adult choking relief. Our BLS CPR course is approved for Lifeguards in Putnam, Westchester, Rockland and Dutchess Counties by the New York State Health Department. Sign up here if you need to renew your Lifeguard CPR certification. CPR Classes are held every Tuesday, Thursday and Saturday. We can hold a group class for staff at a pool or camp for your staff. Use the form at this link to request a class or call 914 947 8998. Lifeguards and camp leaders must renew their CPR annually. The New York State Sanitary Code requires staff to possess a valid two-rescuer CPR certification: For Children’s Camps CPR certification is required for the health director and other staff such as the aquatics director, lifeguards, and certain trip and activity leaders. Swimming Pools and Bathing Beaches - CPR certification is required for all lifeguards. NYS Health Dept. CPR requirement for Lifeguards & Camp Leaders. CPR training for your lifeguard and camp staff in Putnam, Westchester, Dutchess, Rockland, Manhattan, Brooklyn, Queens, the Bronx or Staten Island . CLICK to request training for your staff. The Philips HeartStart AED is easy to use and will guide you through a cardiac arrest emergency.